When I was a little girl, I would often spend a large portion of my school holidays at my grandparents’ house. They lived in a small village, with a small village store, a pub (there’s always a pub) and a small village school. The village school was opposite their house and during the holidays we were allowed to go and play in the schoolyard. My Granny had the most amazing flower gardens so there was no way you were allowed to kick a ball or ride a bike in there. Around the back of the school was a huge playing field, surrounded by tall trees. My Grandad would often take myself and my cousins over to the playing field to play games. As the pine cones started to fall from the trees he would get out his enormous red and white polka dot handkerchief and we’d fill it full of pine cones. With extras tucked in our pockets just in case we didn’t have enough. We’d head back over to the house where we would sit and count our amazing pine cone stash before deciding what to do with them. We’d raid my Grandad’s old garage for spray paints, search for feathers in the field out the back or use my Granny’s twine to decorate the pine cones. This weekend I’m planning on taking the children over to High Lodge, Thetford forest so that we can go on our very own pine cone hunt. Whilst I don’t have enormous handkerchiefs like my Grandad had, I’m hoping that one of the children’s muslin cloths will do the same job. 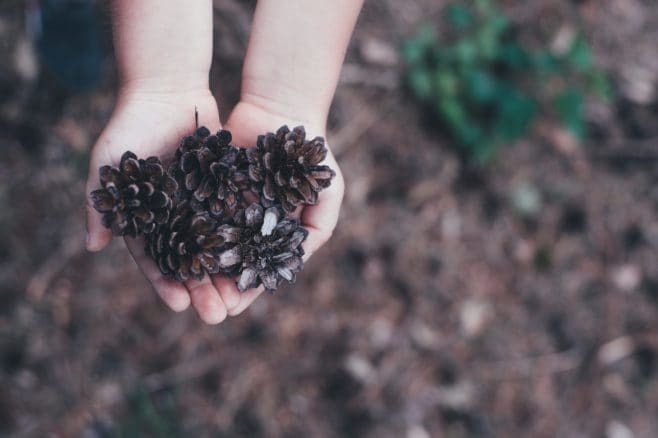 Collecting pine cones is one of my favourite memories from my childhood and I’m hoping to pass this on to my children. Hopefully, we will have a bountiful collection of pine cones upon our return from the forest so I’ve been busy looking for pine cone crafts to complete with the children when we get home. I’m loving the idea of making some Christmas decorations with them. Especially the idea of a garland twined around the banister on the stairs with some fairy lights. Did you collect pine cones as a child? I did collect pine cones and we used to spray some of them at school.